We love seeing our communities thrive and we enjoy celebrating the beauty of Oregon. In fact, many of the meeting rooms at Northwest Community Credit Union’s support center are named after rivers in Oregon! How many of Oregon’s rivers have you seen or are planning to visit? Summer months in the Pacific Northwest bring sun and warm temperatures, making it the perfect time of year to get out and explore. In this three-part series on summer travel in Oregon, we want to highlight some of the wonderful places Oregon has to offer, starting with a few of these scenic rivers. Getting our start in Lane County has provided closeness to this beautiful river. The main section of the Willamette River flows north between the picturesque Oregon Coast Range and the scenic Cascade Mountain range. From Eugene through Portland, there are lots of places to explore! Feel good and do good by helping to protect and restore the Willamette. In Lane County, you can enjoy free fishing days, which are fun for the whole family! Off of the Willamette River runs the McKenzie River, which offers great trails for hiking, biking, and lovely trail views covered with lush tree canopies. Check out some incredible carvings at the McKenzie River Chainsaw & Art Festival. Or, delight in fragrant fields at the McKenzie River Lavender Festival. In Linn County, you can rock out to some great music at the annual River Rhythms Summer Concert Series. In Multnomah County, there is a plethora of places to explore on this vast river. Each year the Tom McCall Waterfront Park hosts a multitude of events, including part of Portland's Rose Festival, the Big Float and the very colorful Dragon Boat races! With plenty to see, taste, and hear, there is something for everyone. We have a special place in our hearts for this river because of our rich heritage in the timber industry! 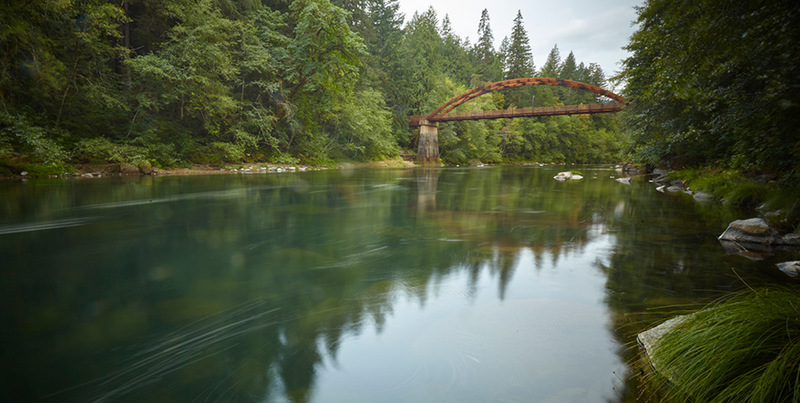 The gorgeous and bountiful Umpqua River flows northwest from Roseburg to Winchester Bay on the coast, which some refer to as the heart of the timber industry of Southern Oregon. Not only does this river give a nod to our timber roots, but it is also rich with Native American and Tribal histories. Known for some of the best fishing, this is a great place to drop a line! Looking for steelhead? The northern sections of the Umpqua are considered premier summer steelhead streams. This abundant river also offers salmon, sturgeon, and plenty of bass to tempt any fisherman. If you’ve ever considered catching some of these tasty fish, or maybe want to try fly fishing, now is a great time to fill up the gas tank and head out to this local river. Ready for more outdoor adventure? This river might be for you. The Deschutes River is located in central Oregon near our Bend branch, and perfect for any adventurer. Go whitewater rafting with a guided tour. Try testing your balance at kayaking or paddle boarding. Whether you like the speed of the rapids or prefer a more peaceful tide, you can find options for everyone here. If you don't want to get wet, you can still enjoy the river! There are plenty of gorgeous hiking trails along the Cascade Lakes National Scenic Byway with striking views of this river. Overlook the river while enjoying some craft beer or lunch at one of several restaurants and breweries located on the river. Looking for some breathtaking bridges? Or maybe a great parks for a summer picnic? Visit the year-round Valley of the Rogue State Park, within a 30-minute drive of both our Medford and Grants Pass branches. This westward flowing river boasts several historic bridges worth seeing. You can even enjoy the view from a river float! The Hellgate Canyon portion of the river is a popular section for floating. Get ready for river banks lined with canopies of stunning trees since this water flows largely through a national forest. With plenty of parks and scenic areas to stop in, you can find great day use areas for picnicking, hiking, or boating. Consider making a weekend trip of this visit and stay in a historic riverside log cabin, or camp at one of the many areas available. Learn about must-see destinations in Oregon or different camping options.